During this series, we’ve been able to weave a thread through the core beliefs and practices that anchor Resist while highlighting some of the key choices we’ve made that continue to move us towards being better, more connected, whole people. In philanthropy, we don’t often think about organizational structure as a critical part of meeting our mission, living into our values, and ensuring our staff harness their full potential. The truth is, structure matters. How you do your work is equally as important as the work itself. One of the many functions of the nonprofit industrial complex is to recreate the corporate model in ways that don’t allow for collective decision-making and accountability. This keeps our work siloed by way of ‘expertise’ or departments — and makes it difficult to adapt to changing conditions. This is not to say that experts don’t matter or that focused department work is always harmful. But, when the voices of those who are directly impacted are left out of decision-making processes, the organization suffers. The staff in our organizations often have capabilities beyond what’s in their job description. They’ve developed skills during different times in their careers or have years of lived experience and practice. Tapping into these skills and expertise ultimately makes our work better. Just as the richness of a harmony multiplies with each extra note, our work is strengthened by multiple, differing voices. Building a structure that honors those voices, and moves the work forward, while building a strong culture of mutual support and accountability is the fun part. What is a Worker Self-Directed Nonprofit? In traditional nonprofits, Boards typically delegate the management of the organization to an Executive Director who then delegates some of that work to their department heads. the Board exercises control through close supervision and direction over the Executive Director. By contrast, in a worker self-directed nonprofit the Board delegates the direction and management of the organization to a collective of self-governing workers. The Board then provides oversight and support to the staff collective to ensure that the self-management system is functioning to advance the organization’s mission. The board does this by way of board meetings and one-on-one check-ins. 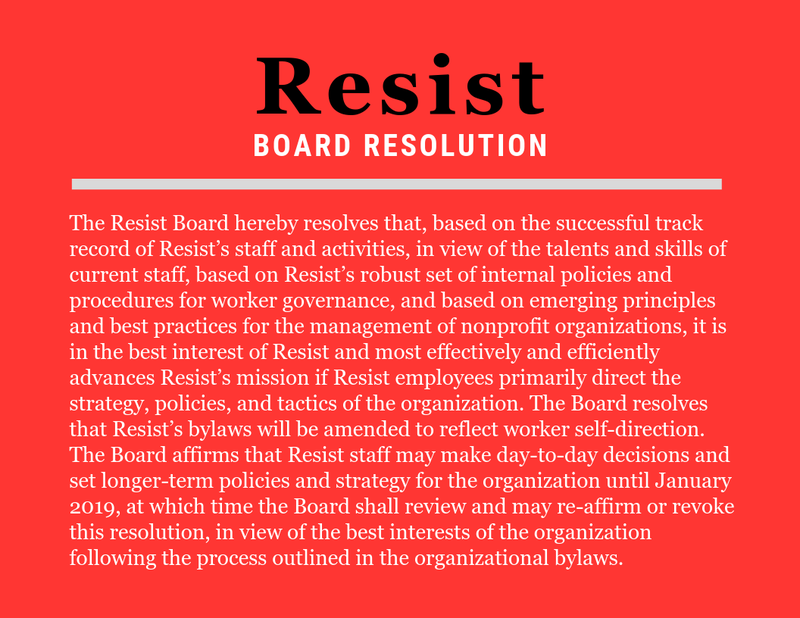 In January of 2018, the Resist Board unanimously approved a board resolution that helped us forge our path towards worker self-direction. The board resolution legally allowed us to implement a new dynamic organizational structure, one that moves us closer to our vision and ensures we’re living into our values. In this model, we honor the experiences and gifts offered by the staff collective members and are in greater alignment with the work happening on the ground. The level of trust and support afforded to us by our Board emboldens us to continue pushing the organization towards more transformative work. Our model consists of the board of directors, the staff collective and three external decision making bodies. Each of these groups has specific functions and decision-making powers as delegated to them by the Board of Directors. These groups do not work in silos, members of the Resist community are often part of more than one decision making body. This ensures that all proposals, discussions, and decisions are in conversation with the other moving pieces within the organization. The Staff Collective is responsible for the vision and direction of the organization, the management of day to day operations and the three external decision making bodies. The collective is comprised of circles (working groups or departments). Circles work on all projects related to that circle’s function. For example, the development circle works on all fundraising projects. All circles are managed using the MOCHA model and are assigned a respective Board Owl. The circles put forth proposals and think about new creative ways to meet our strategic priorities. We use the term “owls” to describe the individuals that make up our Board of Directors. Owls have exceptional eyesight and hearing abilities. Since our board’s primary purpose is to provide oversight, the name is a perfect fit. Each owl position corresponds to a specific circle within the Staff Collective. Owl members fill specific seats based on their interest and expertise. The board also approves all recommendations regarding staff compensation, benefits, and hiring by way of our budget process. Board owls make themselves available on a monthly basis to review updates from the circles, give feedback and guidance at the request of the circle manager. Strategic Design Group: The Strategic Design Group is an ad hoc group convened to give external insight and community voice to organizational change processes. Made up of staff collective members, board members, and other frontline movement leaders that are visionary and emergent thinkers. the strategic design group (SDG) was most recently responsible for creating and approving our theory of change. Grantmaking Panel: Resist’s Grantmaking Panel is responsible for distributing the grants allocation in our annual budget. They rotate on a yearly basis and are compensated for their work. Their feedback informs the direction of our resource redistribution program at Resist. The panel is managed by the Resource Redistribution Circle and its members are current and former grantees. Circle of Elders: Resist’s Circle of Elders is responsible for resolving conflicts that remain unresolved after following our internal accountability process. This body uses a restorative justice framework and has final decision making power on staff or board terminations should that be necessary. Upon exiting Resist, all staff and board members who (1) Left their position in good standing, (2) Have some level of trust and relationship with existing board or staff members, (3) Are willing to serve on this body and participate as needed will be extended an invitation to join the Circle of Elders. These bodies all make up an intricate ecosystem, each group with its own function connected to and dependent on the function of all the rest. Weaving a network, for the purpose of meeting our organizational mission, strengthening our work and transforming philanthropy. We are able to think beyond traditional nonprofit structures and reimagine the way we do our work. As a foundation, we have a responsibility to challenge systemic oppression, not only out in the world but also within our own organization. How are current structures moving us further away from our mission? From each other? And from the communities we serve? Transforming an organization’s structure might seem like a great undertaking, but small is all. What small experiments can you implement today that will get you closer to more collective, collaborative decision making tomorrow? 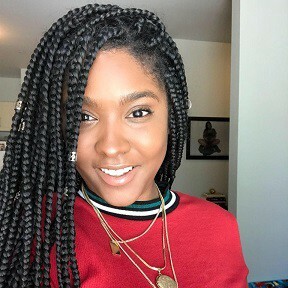 Kendra is a first generation Afro-Latina and is committed to building resilience in communities and capacity in organizations to better center the leadership of those most impacted by structural inequities. A deep spiritual practice, Capoeira Angola, and snarky humor keep her grounded in the work. She’s your local radical negra.